Yep, he’s still in Minnesota. The Jimmy Butler trade saga is far past the point of absurdity, but perhaps there is an end in sight. 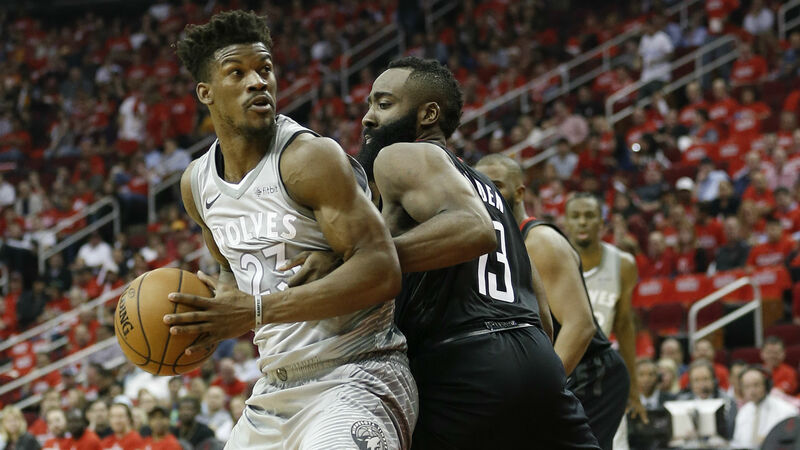 The Rockets tossed out four — yes, four — first-round picks in their most recent offer for Butler, but the Timberwolves didn’t appear to be swayed by Houston’s proposal. Minnesota wants Eric Gordon included in any deal, which doesn’t come as a surprise considering Wolves coach Tom Thibodeau has a playoffs-or-bust mentality. While a Butler trade is not imminent, the circumstances for the Rockets could help accelerate a move. Houston is struggling at 1-4 after an early injury to James Harden and a suspension for Chris Paul. Rockets general manager Daryl Morey knows the team’s window of contention won’t stay open forever. Should the Rockets mortgage the future and do whatever it takes to acquire Butler? Or is the asking price too high? Losing Trevor Ariza and Luc Mbah a Moute in the offseason, plus assistant coach and defensive ace Jeff Bzdelik, certainly hurt the Rockets’ ability to corral opponents. The hope was that new role players like James Ennis and Michael Carter-Williams could at least keep them competitive defensively. It hasn’t worked so far. Houston is a bottom-five team with a 114.7 defensive rating, and even accounting for increased pace around the league, that’s a huge jump from last year’s mark of 105.6. Harden is never going to be a plus defender, and opposing teams are attacking Carmelo Anthony at every opportunity. Clint Capela is a strong rim protector, but he can’t fix everything. This is the strongest argument for adding Butler now. The 29-year-old is a versatile wing who can guard anyone outside of a traditional big. That’s exactly what the Rockets need to truly challenge the Warriors. He can competently switch onto Stephen Curry, Klay Thompson and Kevin Durant. Offensively, Butler isn’t like Harden and Paul in isolation, but he is capable enough with the ball in his hands (0.93 points per possession, 67th percentile last season) and wouldn’t have any issues taking the reins with one of the other stars off the floor. He also alleviates some of the concerns about Harden and/or Paul hitting an offensive slump in the playoffs. From a trade value standpoint, Butler is the one option on the market that could dramatically change Houston’s chances. If Morey is committed to capturing a title during Harden’s prime, then he won’t be concerned about future picks. Those will probably fall in the 20-30 range. Selling on Brandon Knight and Marquese Chriss (eligible to be traded Wednesday) to match salaries isn’t a huge loss. If it requires moving Gordon, so be it. He’s not a top-15 player right now — Butler is. Age will eventually catch up with Harden (29 years old) and Paul (33), as well as role guys like PJ Tucker (33). There is no time like the present. Morey should trust Mike D’Antoni to put the puzzle together. A five-man lineup of Paul, Harden, Butler, Tucker and Capela? That looks like a contender. This current roster doesn’t have enough. Whoa, relax. It’s been five games, and the best Rockets have barely been on the floor together. Butler would help defensively, but there are questions about his fit next to Harden and Paul. That’s three ball-dominant players, and though Harden and Paul are fine with launching 3-pointers, more than 40 percent of Butler’s field-goal attempts last season came between eight and 24 feet (insert D’Antoni groan). There would be an adjustment period. The bigger questions arise from the risk involved with punting on so many future draft picks. NBA rules would require the four first-rounders to be traded in alternating years, so Houston could lose 2019, 2021, 2023 and 2025 selections. It’s easy to assume those picks won’t be worth much, but the Nets thought the same thing when they agreed to one of the worst trades in NBA history. The infamous deal for Paul Pierce and Kevin Garnett set the franchise back years, and Brooklyn is just beginning to recover. If Houston’s offer comes with a sliding scale like ESPN’s Zach Lowe and Adrian Wojnarowski recently discussed on “The Lowe Post” podcast — meaning better players (Gordon) equal less draft picks and worse players (Knight and Chriss) equal more picks — then that comes at a cost as well. Gordon is a valuable player and a solid fit in the Rockets’ system. Obviously Butler is better now than Garnett or Pierce at the time of the Nets-Celtics deal, but it’s impossible to know when aging stars will suddenly drop off in production. Butler missed significant time in 2017-18, and he’s got serious miles on those legs. How many more prime years does he have? For that matter, what does Paul have left with Harden and Butler? Morey is an experienced GM, but none of this is easy. He has to weigh a number of short-term and long-term factors. A Butler trade could push the Rockets closer to a championship — or ruin the team’s future. Regardless of what happens, let’s hope all of this ends soon.